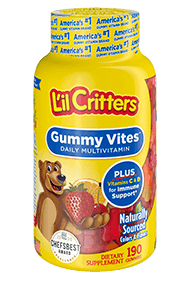 Introducing a new look for L’il Critters™… with the same great taste and essential nutrition. On shelves today! Check out this L’il Critters workout that is perfect for the whole family! Fitness expert Steve Ettinger introduces a routine that’s created to work the whole body, mimicking natural animal movements. From your family room to the park, this is the perfect workout to get you and your L’il Critter moving.